Shhhh! 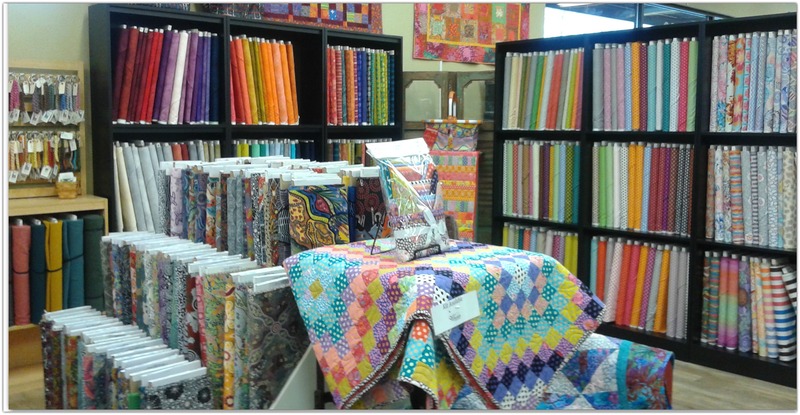 Don’t tell Karen, but I snuck onto her blog because I just had to share pictures from my visit yesterday to Quilt Expressions! Up until I started my full time job this past August as a school secretary, I had the pleasure of working at Quilt Expressions. Imagine spending your day working with fabulous customers and coworkers, beautiful samples, and, of course, the best fabric collection anywhere! Needless to say, I miss that daily dose of creativity and inspiration. As a customer, there’s nothing better than stepping into a store and immediately stopping because, well, you just have to! 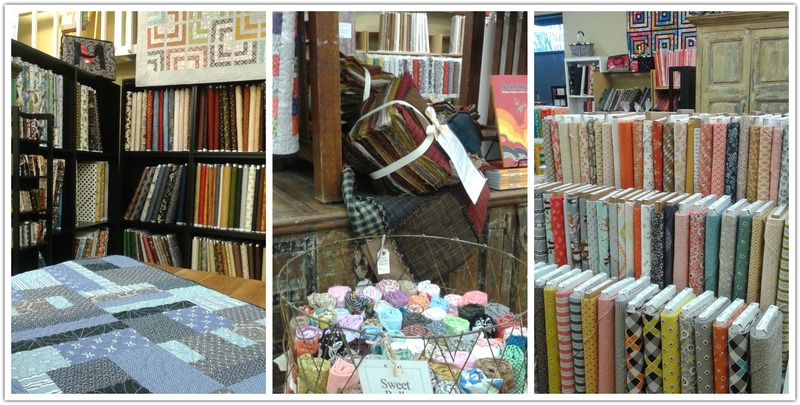 Fabric, notions, samples, and beautiful displays from floor to ceiling catch your eye. You wonder where you should start…and then decide to just dive in! Ever since my first visit about five years ago, it’s been my experience that I have to travel around the store at least three times in order to see everything. And Quilt Expressions never disappoints! 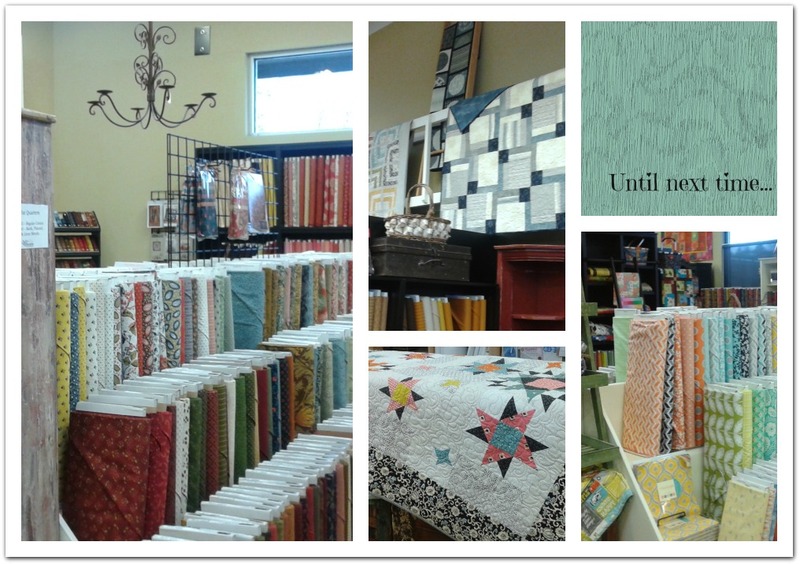 Every quilt sample in the store has been pieced by talented Quilt Expressions’ employees and quilted on the long arm. There’s a pattern, and often a kit, available for every sample in the store. Take a peek here to view the patterns that are available online. Many of them are Quilt Expressions’ originals. Click here for kits that are available for online purchase. Looking for a great way to boost your stash while saving money? Dig through the Sweet Rolls basket for end-of-the-bolt pieces; the price on the tag reflects the 20% discount from the original yardage price. Modern…traditional…Batik…cuddle…Kaffe…baby…themed…I could go on and on. I love knowing that, when I have a particular project in mind, I’m only going to have to make one stop. Karen and Kat have done a fantastic job ensuring that all types of fabric are well represented in the store. See that gorgeous swirl quilting pattern on the quilt in the left photo? (Click on photo for a larger view.) 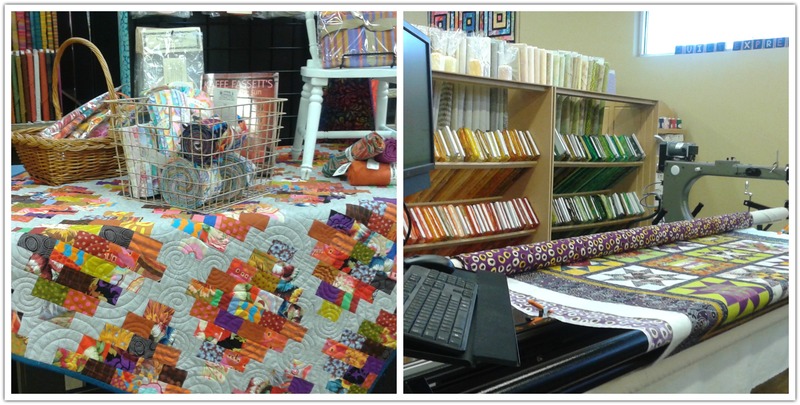 When not helping customers, Rodi and Tracy spend their time in the store quilting customer quilts and store samples. Are you interested in learning how to use the long arm machines? Ask one of the employees, and they’ll be happy to give you the details. It’s quite satisfying to complete a quilt from start to finish all on your own. My favorite quilts to make are baby quilts. They are fast, easy and always loved by the recipient. Luckily, my friends keep having babies, which gives me plenty of opportunity to buy baby fabric. 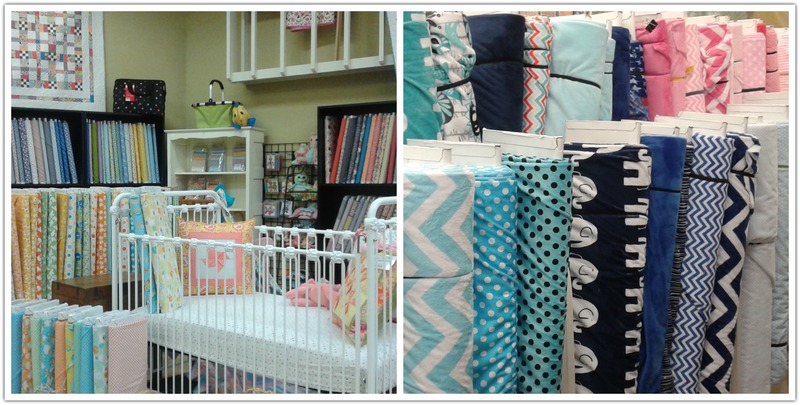 Quilt Expressions has a huge selection of nursery prints, flannel and cuddle. Cuddle makes fabulous backing for baby quilts…it’s soft, 60″ wide (no piecing!) and the quilt patterns show up beautifully. If you’ve never used it for a back, ask one of the employees to show you a quilt with cuddle backing…I guarantee you’ll love it! 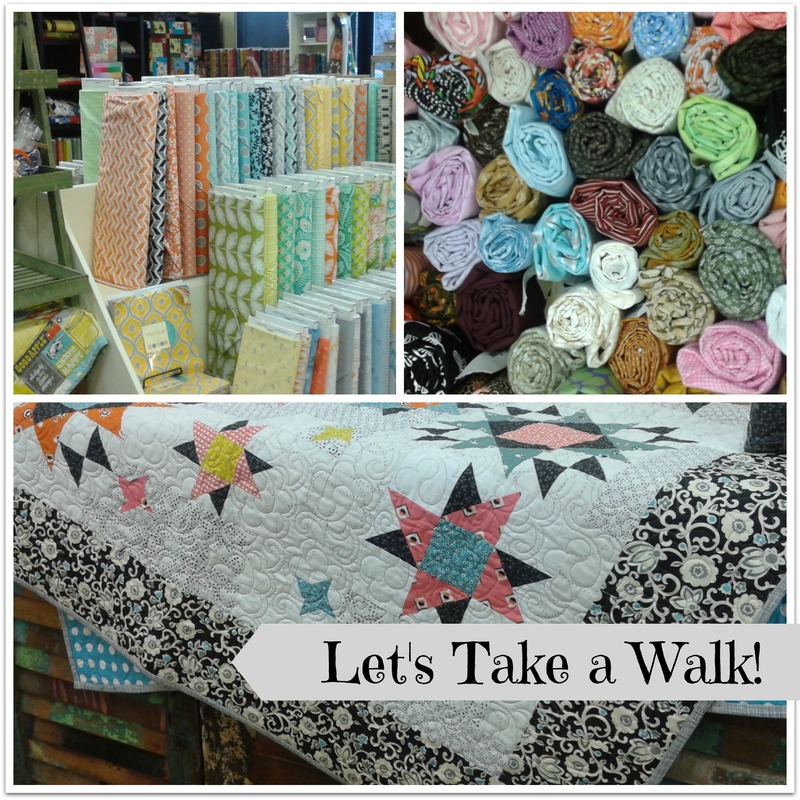 Thanks for joining me on this little tour of Quilt Expressions. These photos represent only a portion of the store…stop in soon for a full tour (don’t forget….three times around the store!). If you’re not in the area, visit the website. Most of the fabric, patterns, kits, notions, precuts, quilts for sale and gift certificates are available online. This entry was posted in Long Arm Love, New Fabric, Pattern Place, Quilt Expressions Originals, Quilt Expressions' Kits, Uncategorized. Bookmark the permalink. Inspiring and well written, interest-piquing post. Great job!